Let us toast National Happy Hour Day this November 12th with a #TokiCapri #Cocktail! The #TokiCapri combines the old school fun of a “capri sun” style drink with adult flavors. I love the balance; Toki lends a light touch of smoke, Aperol with a whisper of bitter, Yuzu and lemon adds an exotic citrus pop and spiced syrup adds a touch of sweet – resulting in a well-balanced cocktail with many delicious layers of flavor. 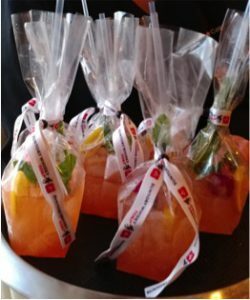 Served in a bag – it’s fun for single service, or large functions….think wedding or parties. The band around the bag is also perfect to customize with a hashtag or special branded message. Measure the Toki, Spiced Ginger Syrup, Aperol, yuzu puree and lemon juice into a pint glass. Fill with ice, cap and shake. Pour into clear drink bag and top with additional ice if needed. Drop in the garnish, insert compostable straw and seal bag. Combine all ingredients in a blender and process until smooth. Fine strain. Cool. Refrigerate for up to 30 days. © 2013-2018 Kathy Casey Liquid Kitchen Terms & Conditions | Copyright | Privacy|ProPhoto Photographer Blogsite by NetRivet, Inc.